The Big Idea: Young children don’t always see how their actions can affect others, especially when emotions take over. But kids can learn to express themselves in a way that doesn’t harm others. Print out the page and read it to kids. Ask, “What if you were angry and hit your friend? How do you think your friend would feel? What could you do instead?” and “What is something nice you’ve done for a friend (share a toy, give a hug)? 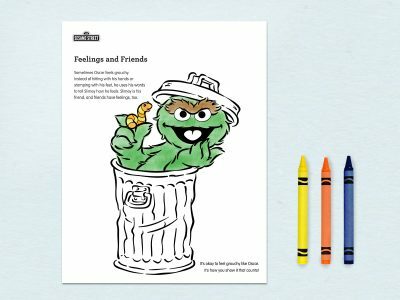 How do you think your friend felt when you did that?” Thinking about others’ feelings (and how they can change others’ feelings) helps kids learn empathy. Let kids color the page.